Where sun and sand means fun and relaxation. Contrary to popular belief, Ibiza isn't just a party island. During the high season, thousands of families descend upon the beautiful White Isle in search of summer sun. With lots and lots of beaches to choose from ranging from long and thin, to small, wild and rugged, there's something to keep everyone happy. Here we give you some of the very best that the island has to offer when it comes to beaches accommodating families. Most beaches are family-friendly, though if it's fun and the freedom to have your little ones running around and bathing safely in shallow waters, then our selection here is for you. Cala Bassa beach, in the west of Ibiza is also one of the finest stretches of sand and very pretty. The reason kids love it is due to its shallow sweeping cove with rock pools for snorkelling, clambering and exploring. This beach is almost like a large natural swimming pool and those waters are hard to resist by all that go. On the beach itself you'll find pedaloes and banana inflatables too. Whilst the kids enjoy the sea and sand, Cala Bassa Beach Club will deliver delicious food and an ice-cold beer directly to your sunbed from one of its five restaurants. The family-friendly beach of Es Canà can be found just north of Santa Eulalia on the east coast of the island. A compact resort, there are three main restaurants and one bar lining the sand, mostly geared up to entertain the whole family. On the beach itself, there are the usual array of pedaloes and water activities to keep all ages amused. The long beach has plenty of space for you to grab a sunbed whilst keeping an eye on your children in the shallow and calm sea. Somehow it never feels overcrowded. For those wanting to get some lovely and original souvenirs, on Wednesdays head to Punta Arabi hippy market, just a stone's throw from the beach and easily reached on foot. The petite beach of Cala Vadella is a 15-minute drive from San José through pine forests on a mountainous road. As you break through the trees, you are welcomed by a pretty little cove with shallow waters and rocky outcrops to each side - great for exploring, snorkelling and adventuring. There's also a dive school here. For some great food and drink at nice prices, Can Jaume is ideal. It's right on the sand and inexpensive. A great spot for watching the yachts anchor up in time for the spectacular sunset. Arguably one of the best Ibiza beaches for families, this beautiful wide, golden sandy Cala Llonga beach is one of the prettiest around. Sporting a children's playground, fun pedaloes and a small amusement park, it's perfect for kids and with lots of affordable places to eat, they and you won't be left going hungry. For a special treat and very close by is divine beach restaurant Amante where you'll get spectacular views of the sea below. Day beds and cocktails for adults and a special menu for children - what's not to like? 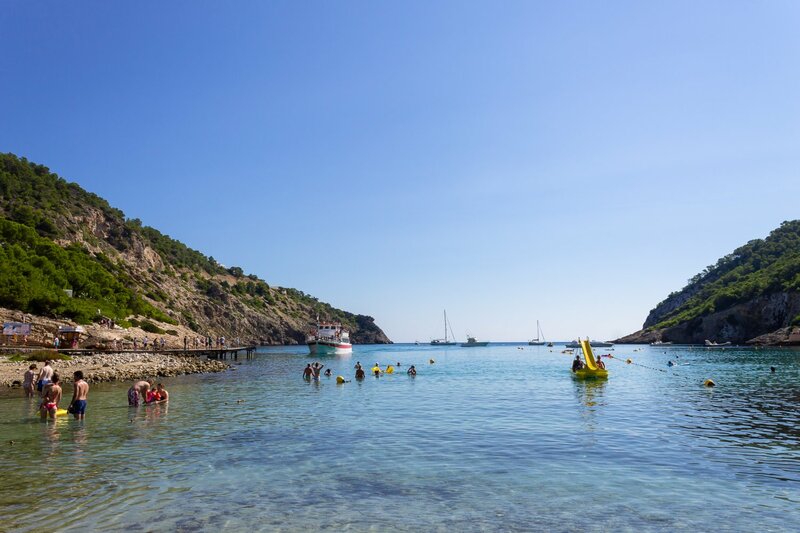 In the most northern tip of the island is the resort of Portinatx and its lovely beaches; a resort which boasts its own little micro-community centred on families. With a total of three glorious beaches, each complete with its own lifeguard, there's plenty of choice for sunbathing, water sports, swimming and snorkelling, all within this compact vicinity. The local accommodation and resorts are geared towards family fun with plenty of day time activities, sports and entertainment to keep every age engaged. The sheltered bay of Cala Tarida beach on the south west coast is right between San José and San Antonio. Here you get a long beach with one end calm and shallow, and the other more rocky and rugged. As well as the much-loved pedaloes, there's also volleyball plus wind or kite surfing. The colour of the sea here is truly breathtaking and the clarity lends itself perfectly to snorkelling and rock pool inspections. A lifeguard is also present daily. There's a great little supermarket in the Plaza Cala Tarida near the Cala Sol apartments, just in case you need to stock up on inflatables, buckets and spades. You can even get all the provisions you need for a wonderful picnic on the sand. If you want to take the family to see all these beaches, you'll need some wheels, so take a look at our special selection of local car hire companies.